Pedal through cowboy country to legendary heritage sites and fossil beds. It’s called “Old West” for a reason – here’s your chance to pedal like a modern-day cowboy, making your way through rangeland, up and down high passes, beside rushing rivers, under a big sky… and stopping in the occasional town to slake your thirst and get some grub. This two- to three-day route offers a cornucopia of terrain and scenery, from ponderosa-pine forests to rushing rivers, from abundant wildlife to hot springs and fossil beds – and some attention-getting climbs. A vast majority of the route is on minimally used roads. The Scenic Bikeway route starts and ends at Kam Wah Chung State Heritage Site in John Day, a one-of-a-kind, well-preserved museum that preserves the legacy of Chinese who lived here and gives you a glimpse into their life here long ago. You can also visit the John Day Fossil Beds National Monument, one of the top paleontology sites in the world, to learn more about the landscape you’re riding through – its geologic makeup, the creatures that once thrived here, and how it’s changed over the eons. 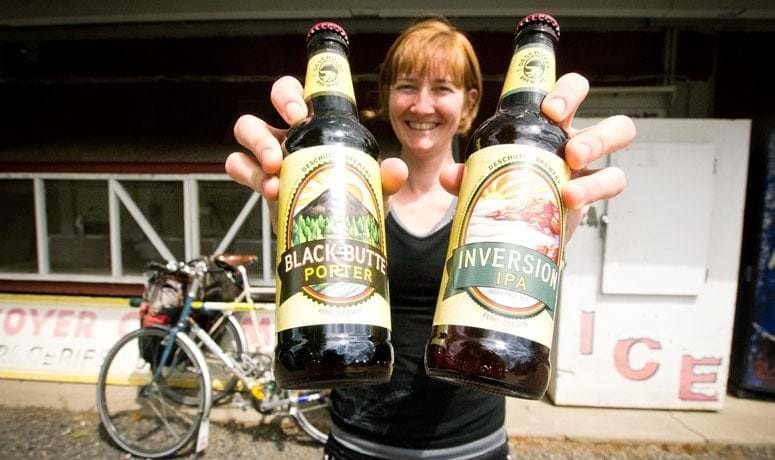 You’ll spend extended time riding next to two branches of the John Day River, where in the right season you might even witness a salmon run. But the soothing sound of water accompanies your ride any time of year. Keep your eyes peeled for the “bald eagle trees” outside Prairie City, where up to 11 bald eagles have been viewed at one time. And drink in the expansive views of the Strawberry Mountain Wilderness from the covered-wagon wayside between Prairie City and Austin Junction (you’ll know it when you see it). 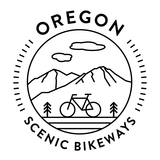 This is one of the best-supported Scenic Bikeways, with 10 communities along the route filled with people ready to warmly greet you and take care of what you need, whether it be a water-bottle refill, a restaurant meal, or directions to the nearest place to stay overnight. There are also three state parks, five additional campgrounds and two bike hostels on this route. 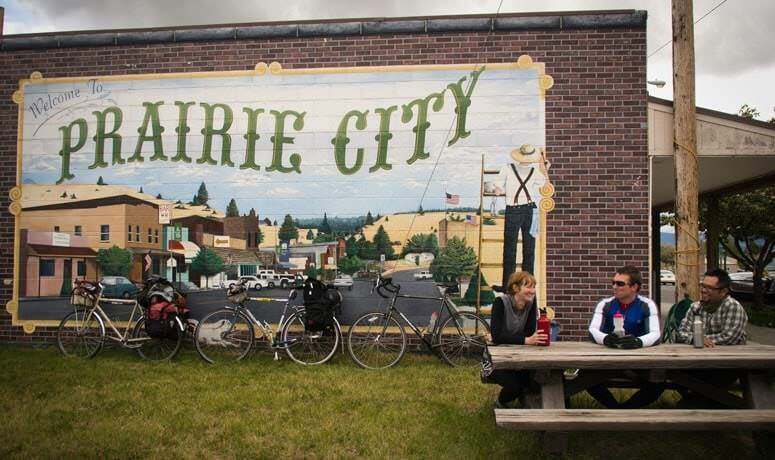 Start in John Day – the biggest town around these parts – heading east on Highway 26 through picturesque Prairie City, after which you’ll ascend to the turnoff at Austin Junction. 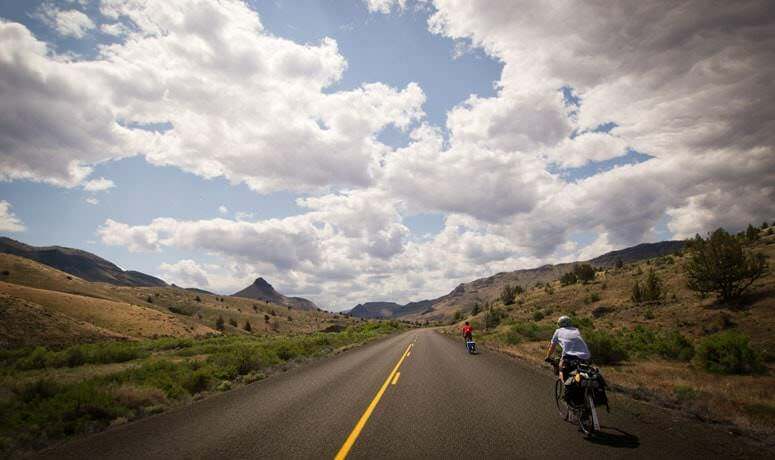 Here you’re on truly rural backroads, passing through the tiny but friendly Long Creek, Monument and Kimberly before heading south to the John Day Fossil Beds, where you reconnect with Highway 26 back to John Day, through Dayville and Mt. Vernon. This works well as a two-day or a three-day trip. Ten additional rides branch off the Old West and provide an additional 800 miles of “ultimate road ride” experience. 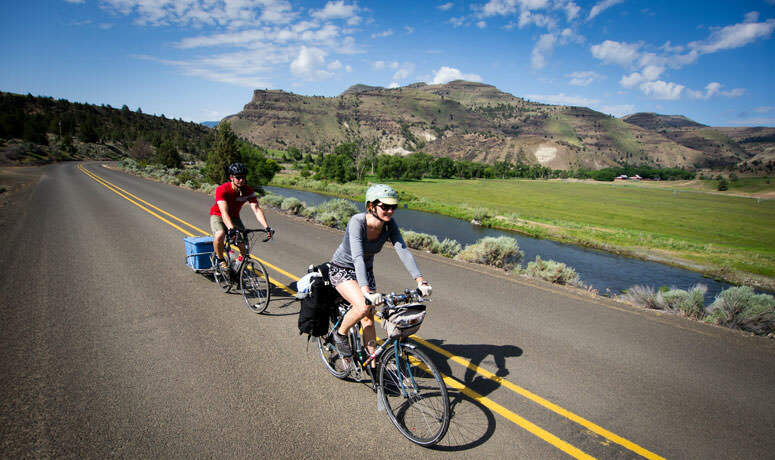 The Grant County Chamber (541-575-0547) has a volunteer who will assist cyclists wanting to plan a day, weekend or longer vacation ride in Grant County. The Grant County Chamber of Commerce is happy to help you find services and attractions along this route. Visit their website or call them at (541) 575-0547. Or, check out Visit Eastern Oregon for more to see and do in this area. Find camping and restroom facilities at Bates State Park and Clyde Holliday State Recreation Site. For current road conditions, please visit Trip Check.